Magically transported from a subway car to the mystical Rock of Eternity, troubled foster kid Billy Batson met an immortal wizard, who granted him magical powers and responsibilities. By uttering the word "Shazam!," Billy is magically transformed from a boy into the adult hero Shazam!, the World's Mightiest Mortal. With the power of living lightning, the strength of a demigod, as well as superhuman speed and flight, Shazam! is the only thing standing between our world and the mystical threats out to destroy it. After decades of stubborn pigheadedness, DC Comics has finally accepted the fact that Marvel is never going to cede the Captain Marvel name back to them, as well as the fact that no one actually thinks of their "Captain Marvel" as anything other than "Shazam." So they finally did what they should have done as early as the 1980s: they officially dropped the Captain Marvel name and are just calling the character Shazam. No more needing different names for the stories and the merchandising, no more name that makes people think of the competition... hooray for the (eventual) triumph of common sense! 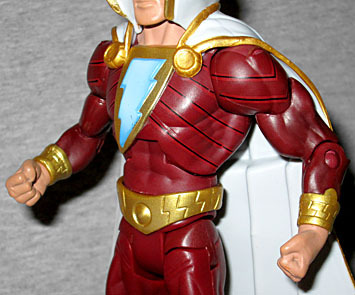 Shazam's "New 52" redesign is one of the best DC has come up with yet. He passes the squint test much better than pantiless Superman does, with a red suit, a white cape, and gold boots, gloves and belt, but it's still clearly a new design: the red is darker than the old design, and the accents are actually gold rather than yellow. His belt and bracelets have a sculted lightning bolt motif, and his boots are rather ornate - it's not just a question of having stitches on the front of his feet, but distinctive raised and sunken sections to make it clear they're not plain cloth. It does have the sort of "armored" look a lot of the New 52 designs do, but the lines are just painted on for this figure - a thin black line with lighter stripes flanking it to fake the highlights and shadows of a slightly beveled edge. The most drastic change to the design is his cape. 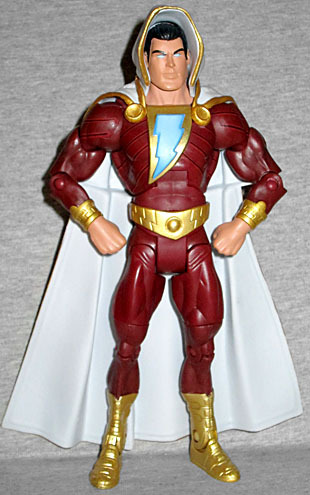 Captain Marvel was famous for wearing a little demi-cape that had a high collar and hung off one shoulder, while Shazam's new cape is more traditionally superheroic. It attaches to both sides of his neck, and reaches all the way to his ankles. It's still white with gold trim, but there's no cord around the neck, no collar, and no knotted designs on the back. The reasoning behind the change makes sense - it's meant to look less like something a circus strongman would wear, and more like a wizard's cloak (to tie in with his magical origins) - but it does make a pretty substantial change to the character's iconic look, especially since he has a big hood covering his head now. The one on the toy is done pretty poorly, sticking up much higher than the toy's head. There's a reason Desaad and The Spectre had their hoods molded as part of their heads. On the plus side, the hood is removable. In fact, it was that bit of info that pushed this exclusive into the "buy" column for me. Pulling it off leaves us with an excellent Captain Marvel head. He's got slicked-back black hair, thick eyebrows, and a youthful, meaty face. His jaw is delightfully wide! If he were smiling, he'd be nearly perfect! Rather than normal irises and pupils, Shazam's eyes are the same bright electric blue as the lightning bolt on his chest. The bolt there is a raised element of the sculpt, as is the gold triangle it's set against. In the comics the bolt looks almost like a window set into his chest, with electricity packed behind it - small sparks pour out of it and cascade off his chest, and there's a darkness that implies depth. This one has darker blue paint around the edges, but it could really use some Kirby dots to bring it to life. 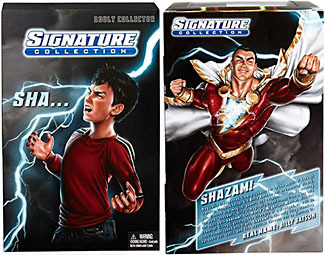 Shazam is technically a part of the DC Signature Collection, so he's sold in the same trapezoidal box. 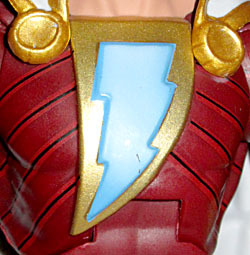 Rather than black, though, the box is red and gold, to mimick the look of Shazam's chest. The backdrop is the energetic blue lightning we were talking about before, and there's shiny golden foil for the edges of the lightning bolt and the figure's name. In the tray, Shazam is held in a simple flying pose, with his arms above his head and his toes pointing down (though you can't see them). Just like on the normal releases, Mike Thompson did the fancy paintings of the character. 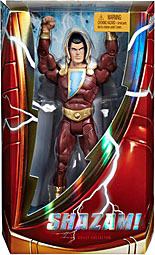 It actually begins on the outer box, where Billy Batson is yelling "SHA..." as lightning strikes behind him. 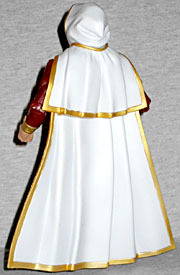 On the back of the interior box, we see Shazam flying through a dark sky. It's a great image, making him look much lighter and friendlier than the comics have managed lately, and perfectly portraying the "chest window" thing we mentioned before. Knowing Mattel, we're surprised they didn't take the opportunity of the shouting Billy Batson to include some kind of sound feature when the box was opened. Surprised, but glad. Nobody needs a toy yelling at them every time they go near it. If not for the removable hood, I wouldn't have bought this figure - it really does look that bad. But it turns out everything else about him, from the packaging to the paint, is truly well done, and I'm glad I took the risk. But most of all, it's just nice that DC has finally joined the rest of the human race in calling the guy Shazam.